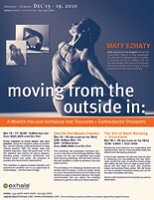 Don’t miss the opportunity to study and practice with Maty Ezraty this December!! Ashtanga Yoga is a classical method employing a gradual systematic approach to learning and challenging yourself. Working at your own pace, with teacher supervision, the Mysore room is engaging and dynamic. Maty Ezraty is known for her unique approach to the Mysore classes. She works to help each student find their way with the practice and is attentive to the correct alignment of the poses. She uses props when needed to facilitate greater understanding. She also works with common injuries. It is recommended that students are familiar with the order of the postures. This workshop will emphasize individual one-on-one instruction in the Ashtanga Method. Maty is known for her use of alignment and props when teaching Ashtanga. She will work individually with students in order to achieve a free and joyful practice.This workshop is for Ashtanga students who are familiar with the series. It does not matter where you are in the series! Practice will be limited to 35 students to assure individual attention. It is highly recommended that you attend the Teacher’s Intensive to get the most out of these sessions. The arms and legs are powerful channels to the spine when properly aligned. In this workshop we will learn to use the arms and legs in order to create integration and strength. We will emphasize how to use them properly in backbends so that they free the spine and enable us to feel the lightness to the heart and chest when practiced correctly. We will also explore how to protect our weaknesses and challenge our obstacles for optimal, balanced practice. Finding more freedom in the chest and heart are the gifts of backbends. Be prepared to have fun and to explore your practice. It’s all in the set up! This class is for those challenged by arm balances and for those who love them! We will explore poses that will strengthen and prepare for arm balances. Basic shoulder alignment will be built through simpler poses and carried forth to full arm balances. Students will be guided through a sequence that will prepare the foundation necessary to do these poses with ease and freedom. Yoga is an art that can be cultivated with practice, inspiration, and dedication. Taking time from our regular routine to work in an intensive format gives us an opportunity to see our practice with new eyes and open to greater possibilities.In this week long Intensive we will move deeper into the heart of yoga as we systematically cover the major groups of poses. As we work to clarify the action of each asana group we will learn to adapt them to our particular needs and conditions. Maty Ezraty has made it her life’s work to transmit yoga and offer useful organizing principles for understanding asana. known for her humor and persistence in teaching good asana form, maty invokes a fun and open atmosphere. This intensive is open to teachers and students wanting to deepen their practice. It is an invitation to welcome the new year with a deeper commitment to our practice. Reading bodies and the art of hands on adjustments are both fundamental tools for teaching yoga. As teachers, we need to refine our ability to see students and be able to help each individual move to the next level in their practice. In this workshop we will develop our ability to see and touch effectively. We will learn to be sensitive with our hands so we can communicate to our students in yet another way. We will learn to see when a student’s pose could benefit from adjustments and then learn how to make those adjustments safely and effectively using words, visual guidance, hands on or props. This is essential training for all teachers and valuable for non teachers who wish to deepen and refine their asana practice. This workshop is open to teachers and to students who want to deepen their understanding of Asana. Each class will begin with a short practice. Partner work and observation of bodies will be used.